The B-50's development was approved in 1944, when the aircraft was known as the B-29D. Still in the midst of war, the Army Air Forces (AAF) wanted a significantly improved B-29 that could carry heavy loads of conventional weapons faster and farther. As World War II ended, the production of thousands of B-29s was canceled. The B-29D survived, but its purpose was changed. Redesignated as the B-50 in December 1945, the improved bomber was now earmarked for the atomic role. 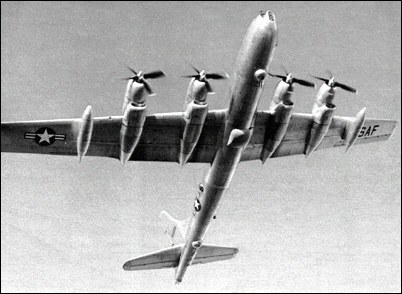 The decision was prompted by the uncertain fate of Convair B-36, the first long-range, heavy bomber produced as an atomic carrier. Of course, some of the B-29s that had been modified to carry the atomic bomb remained available, and surplus B-29s were being reconfigured for the atomic task. Just the same, the B-29s of war vintage were nearly obsolete. Hence, they would have to be replaced by a more efficient, atomic-capable bomber pending availability of the intercontinental B-36 or of another bomber truly suitable for the delivery of atomic weaponry. In keeping with the usual vicissitudes accompanying the development of any new or improved aircraft, the B-50 soon exhibited engine malfunctions. Then, cracking of the metal skin on the trailing edge of the wings and flaps dictated extensive modifications. And while these problems were being resolved, new requirements were levied on the aircraft. 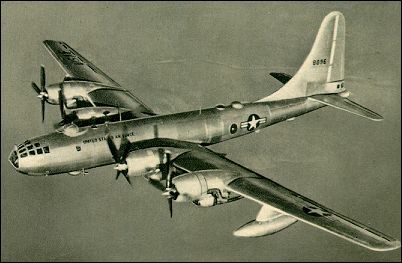 In 1949, as the proposed RB-36 remained a long way off, and because of the older RB-29's deficiencies in speed, range, and altitude, some B-50s had to be fitted for the reconnaissance role. To make matters worse, fuel tank overflows, leaking fuel check valves, failures of the engine turbo-chargers, generator defects, and the like continued to plague every B-50 version. Meanwhile, contrary to plans, most B-50s came off the production lines without the receiver end of the new air-to-air refueling system being developed by Boeing. Additional, and successful, modifications therefore ensued. Nevertheless, the Strategic Air Command (SAC) had no illusions. The B-50, along with the B-36 (first delivered in June 1948), would be obsolete in 1951. That the B-50 did not start leaving the SAC inventory before 1953 was due to the production problems and many modifications of its replacement: the subsonic B-47. now 86 and still would like to hear from anybody about B50's particularly mather AFB from about 1950 to 1954. For Brian Carlson: I have a lot of information for you. Email me please. Hey, Stuart Murphy. I was at Palm Beach in 1958 also on the crew that photographed Yahoo and Umbrella. Your post indicated you had been to Eniwetok. I'm not aware of any other times other than Apr-May-June '58 Operation Hardtack that we had an RB-50 there. I was second photo and acting Operation NCO. You are right, very few of the prop plane crews left. I was stationed in the 1370th photo mapping sqd at Turner field in Ga 1961-1963 Tdy to Georgetown British Guiana and Port Moresby New Guiana then PCS to 6486th Hickam AFB Hi. Took radio and Radar repair at Keesler AFB Miss 1961-62.would like to hear from anyone who might have been stationed at either base at that time. I WAS ACREW MEMBER B-50 AT MATHER ARFB SAC CALIF. AS A SR. BOMB NAV.TECK. WE WERE TRAINED ON E-6 AUTOPILOT [HOHEYWELL] AND NORDEN BOMBSIGHT---1952-1953 35 A AND E SQ. Looking for anyone who knew my father-in-law T/Sgt Edgar Stoelting in the early-mid1950s. He was in the 343 SRS and 6091 SRS. Thanks. I was a tail gunner with "Menting's Meatheads" in the 6091 Recon Sq. in 1955. Flew many recon missions on an RB-50 while at Yokota AB in Japan. Great times except when an engine blew one night on takeoff. Makes for an interesting pucker time. Great engineer had that puppy "fire-out and feathered" in seconds and a great AC (Capt. Carrol V. Menting) had us back on the ground in minutes. Never saw so many fire trucks in my short 20 year old life. Was an airborne radio Maintenance technician, 1370 PMW AST-7, Guam, 1962. Got to ride the bombardier position during in flight maintenance testing. The take off and landings were fantastic. Nothing like the view of the runway coming up to meet you up close and personal. This message is in reply to J Stewart, 20.07.2015. My dad was also a weather observer stationed on Guam at the same time. He was suppose to be on that flight but schedules were changed at the last minute. He is still living and talks frequently about this incident. He spent many hours after looking for this aircraft. My dad was a weather observer stationed on Guam with the 54th weather squadron. The B50 he was flying in went down 500 miles off Guam during typhoon Ophelia in Jan of 1958. He loved flying and took some beautiful pictures from the eyes of several typhoons.Guess the typhoon was stronger than the aircraft. Anyone remember or was it too long ago? My dad was Capt. Marcus George Miller. Assigned to the 431st 1959 at Turner AFB Albany, Ga. Worked in the Hydraulic shop. We moved to Biggs AFB, El Paso, Tx 1960 and I left the 431st October 1963 fot Bien Hoa, Vietnam. I remember all the TDY trips to Hickham AFB Hawaii, Wake Island, Guam. Phillipines and you name it. I'd do it again. My e-mail address is panaberry@gmail.com. I do not know why it shows up as an = sign instead of the @ sign. sheer a prop shaft and dropped a prop into the bedroom of a house in Bakersfield while they were in the kitchen eating supper. If anyone was there there during these years please send me and e-mail and let us get acquainted. My wife passed away on June 27, 2011. I will soon be 84 years old and am now living in Friends Home, Inc. in Greensboro, NC. One of the problems we had with the planes was a shortage of parts and we would have to get a scounge slip and take parts from a plane that was not scheduled to fly that day and use them on one that was scheduled. Captain Mauldone was one of the test pilots that would fly the plane on a two hour test flight after an engine change. The day I was discharged, he left for Japan for a tour there. I last saw him in Birmingham, Alabama where he was in charge of flight acceptance for the Air Force after we completed the work at Hayes International where we were modifying the B-50's to a three point reel tanker, the KB-50. He had been promoted to Major by the time he came to Hayes. I flew recon missions for USAF Security Service on RB-50Gs out of Yokota AB in 1957. The aircraft and crew were from the 6091st Recon Sqdn and a fine bunch they were. It seems that the aircraft required a great deal of repair as system and engine failures were common but for an additional $50 a month hazardous dut pay it suited the life-style of a 20 year old in Japan. I still have contact with some of my usafss buddies but lost touch with 91st guys. It was a brief but great time in my life.